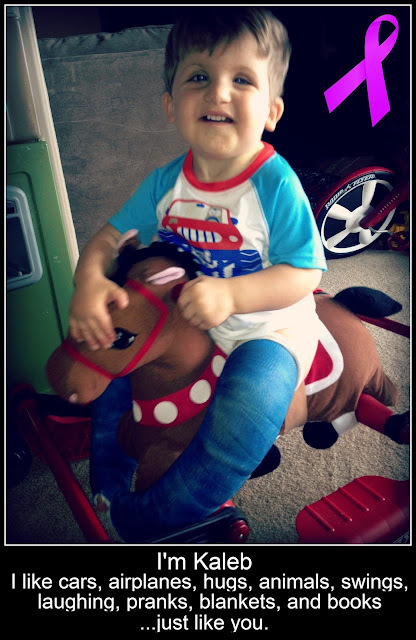 I recently read an amazing blog post by a fellow special needs mommy. It's so nice to see these stories because they remind me that I'm not alone in this journey and hopefully show "typical parents" a glimpse into our lives. To understand my following comments please read that blog post h e r e.
This is exactly how I felt when I was asked to come to a mommy's home for a playgroup. A playgroup of mommies and babies that I had never met before and more importantly, they knew nothing about my normal as a special needs mommy. How would I explain the feeding tube, the diagnoses, the scars, the delays? I've got to make sure the solid foods the other kids have aren't in reach of Kaleb. The hardest part for me was watching the children who are younger than Kaleb walk and run and talk while Kaleb crawls around in silence, except for the few babbles he lets out from time to time. Luckily for me, that playgroup of mommies and their babies have now become my friends. They understand the best they can and ask questions which I love. If you see us out, please don't just stare and point...ask questions. Just like you, I'm always happy to tell people about my amazing children. Kaleb went back to St. Louis this week and while there we found out that this was going to be his last pair of pre-surgery casts! How exciting! Dennis was able to schedule all three of his surgeries and speak with anesthesia for his pre-op. June 21st-23rd- Chicago for our Trisomy 9 conference!! After Kaleb's last surgery he will have to build up to wearing braces with a bar in between to 23 hours a day for 2 years. I think in the beginning its only a few hours...or maybe its the opposite way and 23 hours to begin with for a few weeks? Who knows, I'm just happy to know future dates for St. Louis! Yay!! Thanks again to everyone for helping with Nolan, donations, gas cards, and of course the Southwest Miles into Smiles program for this most recent trip this week. They gave us free round trips tickets for medical transportation. We are forever grateful! We have now been traveling to St. Louis for Orthopedic treatments for Kaleb for about 2 months. This has definitely been an interesting journey filled with ups and downs. Sometimes I feel like I'm a crazy person who has chosen the most difficult thing to do but then I remember that this is necessary and I'm only doing what is best for my child, crazy or not. So far Kaleb is on his 4th set of casts bilaterally and will hopefully only need two more casts, three surgeries, and then many follow ups. It's really neat to see the progression every week. For example, Kaleb's middle three toes on both feet have always been pulled up (they don't extend to the floor when standing). Since the beginning of his casting though almost all of these toes have been stretched so much that they aren't pulled up anymore. Even during his ortho treatments when he was a baby (basically the same treatments, just different doctor) we never saw these toes come down at all. Where there is great progress there is also great worry. The way that Kaleb's feet are positioned in the casts basically are in the shape of a ballerina standing on her toes (sorry..I'm no ballerina so the specific term alludes me). Because of the way that his feet are pointing and stretched it pulls his feet down. When the casts come off his feet it looks painful. Think about sitting in a specific position for a while and then getting up and moving that body part. But with Kaleb, his feet are always in this position and have been for months. When he got his 2nd pair of casts off, his feet were actually very bruised, black and blue. I was so worried. The doctor assured me it was okay but it's hard to see bruises like that on your child. Especially when your child can't communicate to you what it feels like, if they are in pain, if they can move their feet, ect. All in all things are good, especially when I think of the alternative and the very real possibility of Kaleb being able to walk. I cannot wait for this process to be over (the end of the surgeries...I can deal with the twice a year follow ups and then once a year). It's hard on all of us and I hate dragging Nolan along...he's been doing very well considering he's in the car for nearly 17 hours during a one way trip. Thanks to everyone that has donated to us or helped us in anyway. Especially if you have traveled with me...it's not easy. We appreciate each and everyone one of you!